Before I start talking wrestling – because I know that it is not necessarily the kind of thing that dozens of you who read this (if I manage to reach dozens!) are particularly interested in – I should say that I have started numbering books differently. I have added up all of the books that I have reveiwed her on my little blog and this is number 221. So that is how I shall do it from now on. On to the important thing of talking rasslin! 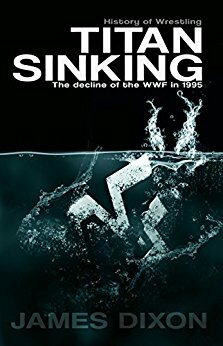 Titan Sinking documents the intricacies of 1995 in the then WWF. Wrestling fans of the time will know that as an annus horribilus for the company. Vince McMahon was fresh off of a grand jury trial suggesting that he was supplying steroids to his workers, and as a result he got rid of many of the huge muscle bound stars that were in the fed at the time. This left a massive gap, and we who are inclined to look back fondly tend to remember the likes of Bret Hart and Shawn Michaels coming to the forefront and becoming stars. We try and push back the fact that this year also saw the debuts of Duke Droese, the wrestling binman, TJ Hopper, the wrestling plumber, and Mantaur, a wrestling bull. No, really. This is the period in time that when I am teased for liking to watch two half naked men pretend to fight each other, I can look back and think that at least I am not watching an evil dentist fight a clown. This makes it an interesting period to look at, so I eagerly bought this and tucked straight in. At first, I was a little underwhelmed. Dixon has a tendency to write as though he was there – mentions of Vince sighing and putting his head back in his chair for instance – that I don’t think work very well in a historical look at things. However, it didn’t take long for me to change my tune. This book is incredibly well researched, and presented in an engaging and entertaining way. There is somewhat of an over reliance on two or three sources – Jim Cornette and Bob Holly seem to have something to say about everything – but I will genuinely forgive this for the fact that it shows that it has been researched! The temptation to include unfounded gossip must be great, but when that happens, Dixon is clear that this is what it is. His seven or eight pages on the Randy Savage and Vince’s daughter Stephanie rumours are wonderfully written and the best thing that I have seen on that possible event. What I find interesting about this book aside from the wrestling, is that I do believe that it is self published. I don’t know too much about how this works, but it seems that with my Amazon Prime membership, I may be able to read this book – and his two follow up books – for free. But I feel this would be taking money away from someone who is doing a great thing and putting a dream out there. As a result, I am reluctant to do so, and although they are pretty expensive, I would like to save a little and get them in paper form I think. If anyone knows anything different to this on how it works, then let me know as I would be very interested to find out more.